MANILA, Philippines (Updated as of 05/11/2017) – The 'May 2017 Civil Engineering (CE) board exam results', together with the list of passers, top 10 examinees, top performing schools and related announcements are available at this website as PRC officially released the results online three (3) working days after the last day of board examination. As announced, 2,514 out of 6,998 passed the exams. The May 2017 Civil Engineer licensure exams are administered by PRC Board of Civil Engineering headed by its Chairman, Engr. Praxedes P. Bernardo and its members, Engr. Pericles P. Dakay and Engr. Romeo A. Estañero on May 7-8, 2017 at PRC testing centers in Manila, Baguio, Cagayan de Oro, Cebu, Davao, Iloilo, Legazpi, Lucena, Pagadian, Tacloban, Tuguegarao and Zamboanga. The schedule of online appointment for issuance of Professional ID and Certificate of Registration will be from May 19-25, 2017. According to the Commission’s Resolution No. 2016-1019 series of 2016 entitled “Schedule of Licensure Examination for Year 2017”, the target release date of May 2017 Civil Engineering CE result will be in three (3) working days after the last day of board examinations or by May 11, 2017 (Thursday). However, results may also be released earlier or later without prior notice. On the same exams conducted by PRC last year, November 2016 and May 2016, results were out after three (3) working days. The two days Civil Engineering board exams covered the following topics, courtesy of PRC. Civil Engineering is one of the programs with huge number of examinees being administered by PRC. During the same licensure exams conducted November 2016, 5,036 out of 10,972 examinees passed. UP and UPLB got the first two spots in the top performing schools having 96.08% and 95.16% overall respective passing rate. Sirven Carandang Garibay from UPLB ranked first garnering 93.20% rating. He was followed by Samuel Eliezer Yu Uy and Selina Dianne King Bernardo, both from University of San Carlos having 92.75% and 92.65% ratings. Meanwhile below is the statistics of Civil Engineering board exam results in the last three (3) years. 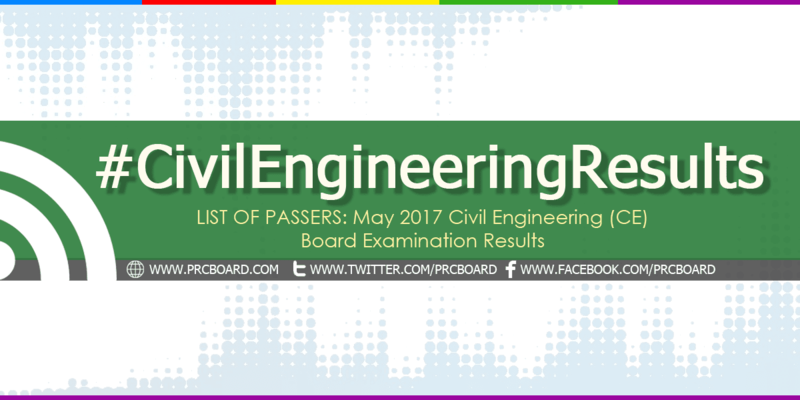 To receive up-to-date news about May 2017 Civil Engineer board exam results, we advise our visitors to bookmark this page, visit PRC official website or follow us at our social media pages via Facebook and Twitter. Advance congratulations to all new Civil Engineer. God bless. Everyone has his/her own time to have his/her licensed. Some will pass and some will fail. No matter what the result may be, I know for a fact that there is something planned for everyone. Not everyone will have the same story of life. God will provide was we need and not only what we want. Can't wait to see the list of names of new Engineers..
Good luck to all soon-to-be Licensed Civil Engineers! Continue praying and keep the faith! there's nothing for you to be worried about for as long as you do your best & you know to yourself that you strive hard for the board, let our Almighty God do the rest...Hold on...have FAITH! ang tagal naman ng result.. delayed ba? What time are the result of Civil Engineering board exam? Ano pong time marerelease yung results? Congratulations to our new Engineers! Kudos! Father, I come to you today with faith so small I cannot see a way. I want to believe you are able to do more than I ever imagine. I want to walk by faith and not by sight. God, please bring a miracle into my life. I know that you can do the impossible in my life and I am trusting in your promises. Thank you for being a God who sees and hears my every need. In Jesus' name, amen. Hahahaha same here ang tagal ng result. Well sad to say, my X boyfriend didn't pass the board. As well as her new gf. For I know the plans I have for you,Declares the Lord, Plans to prosper you and not to harm you, but to give you hope and the Future..Jeremiah 29;11 God bless Us all Civil Engineers..
Mga anong oras kaya marerelease yung result.? For those who fail don""t worry, for those who pass thanks to he Lord. He decides everything of our fate. the truth is we have second chance to those who fail and there is still 3 and 4. life will not stop as long we are breathing. Mabuhay all Civil Engineers. I thank Our Lord for helping my son pass.But still praying for guidance for his job hunting. Good luck to all who pass and for those who failed,keep trying.I'm sure you will see your name in this board passer list next time.Once again... Thank You Lord. I feel this is among the so much vital info for me. And i'm glad studying your article. great, the articles is actually excellent :D.
You are my aspiration, I possess few blogs and infrequently run out from brand :). Yay google is my queen helped me to find this great site! online grant applications so I have been looking around for the finest site to get one. Nice response in return of this question with firm arguments and telling the whole thing concerning that.